Office dress codes have gotten more and more relaxed. Especially here in the Bay Area, many offices are ditching official dress codes allowing employees to come dressed more casually. That means denim is replacing suits, and ties have virtually disappeared. Now don’t get me wrong, I appreciate comfort while working, but there is something about being in a well put together outfit that gives me a certain confidence in the office. 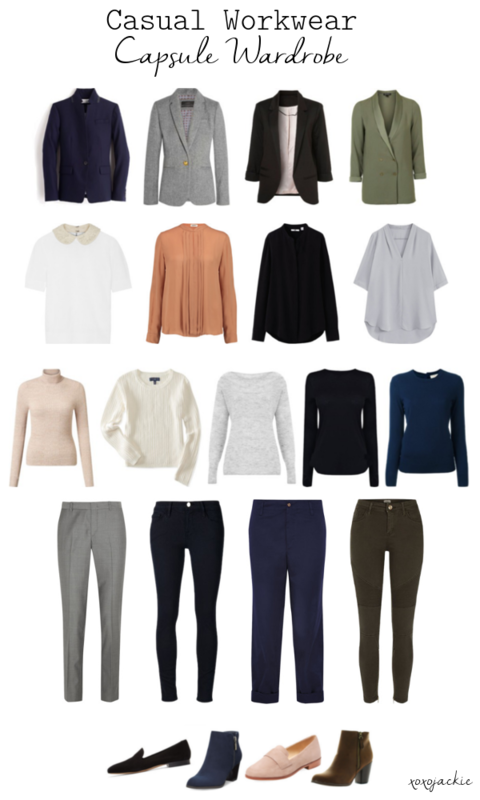 Combining comfort with casual workwear, I have been working on my work capsule wardrobe that I like to call, A Step Above Casual Workwear. Putting together a cohesive work wardrobe with interchangeable pieces makes it effortless to get ready each morning and look your best. My everyday work wardrobe contains 4 categories – blazers, blouses, sweaters, and pants. During the winter, I usually end up cutting out blouses, as I run cold, and offices tend to be run by men. brr. When picking pieces in these categories, I focus on maximizing the use of every item. For example, when purchasing a sweater, I visualize a few outfit combinations before making a buy. Can I wear this in the office? On the weekend? The best pieces are ones that can be dressed up or down and worn a few different ways. Creating a cohesive capsule allows you to mix and match without breaking the bank on a whole closet full of work clothes. My Dad is definitely a believer of this, though retired, he still dresses sharper than most. While I’m not shooting to be the best dressed, I do believe there are tangible benefits from showing up to work well dressed. 1. Boost of Confidence. When you are well dressed, you get an instant sense of confidence. Look good, feel good. 2. People Treat You with Respect. Others notice the effort you put into yourself, it gives a bit of insight into your work ethic. 3. First Impressions Matter. Especially working in the client/partner field, first impressions mean everything. I really do attribute some of my success to making great first impressions. This wardrobe contains 21 items, and each piece can be mixed and matched for new looks all month long. Update ! I made this collage on Polyvore (RIP) so I don’t have links to all of the exact products anymore. So sad! However, I can tell you that I tend to stick with Zara and J Crew for my work staples. Hope to get a new post out soon with links! What do you think about casual workplaces?